money handed to us from BLT was for posting the samples to Levengood. 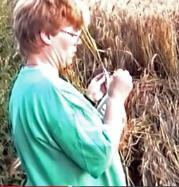 years out in the fields doing measuring and sampling etc for C.P.R. (Circles Phenomenon Research). process (everything came back positive when we knew this was not correct). lodging. James and I spent hours doing this and got no results back and I must say this happened quite often. The whole answer to the questions asked were total crap, it sounded to me that what she didn't know she made up. future. Most of what she said on Coast to Coast is not worth writing about. You have my permission to use this email or any part as you wish. Anyway I do hope you are feeling much better now. Please say hi to Synthia from me, please keep well and happy. to you in any way." her mouth in public in future."